Over the past few years, this claim has stirred controversy in the design world. There are plenty of reasons to take either side – yes everyone is, no everyone isn’t – because ultimately, design is a matter of perspective. Technically, we make multiple design decisions each day, whether we realise it or not. We coordinate outfits, plan holidays, prepare lunches, watch films, read books, and post pictures to our Instagrams – #aesthetic. So, if design is based on decision-making, then yeah, OK. Everybody could be a designer. But we’re not all designers in the traditional sense. So what about brand design? Here’s where lines blur – and graphic designers are distinguished from communication designers – because brand design is more than the way a company looks. Ideas can come from anyone, anywhere, at any time. Everyone has a contribution to make when it comes to brand design, and frankly, that’s a good thing. Though designers bring their own specialty to the table, they naturally need to be briefed by clients on how an organic fashion house sews clothes, or how a VR hotel operates, or what the Kaalikääryleet at the Finnish restaurant is made from. And when we work together, collective thoughts spark more ideas. However, excessive ideas are problematic. As they say, too many cooks ruin the macadamia-crusted, gin-cured, salmon soufflé. In brand design, the role of a designer is to filter the relevant information from the redundant and facilitate conversations that are truly instructive. Though it’s important for everyone to participate in the conceptual stage, it’s also essential for the designer or design team to take the lead in the design process. A good designer is objective. And people consuming design aren’t. Professional designers draw on knowledge, tools, science and experience to create something that resonates with the intended audience. They engage psychology and studies on human behaviour to make informed decisions. To put it simply, good design is based on scientific method, not just on pretty pictures. It’s hard for anyone to push aside their subjectivity, because as people, we’re led by our emotions, tastes, assumptions, contexts, and opinions. A good designer is your friend, because they help you navigate feelings and facts. A brand is more than design. Brands aren’t entirely defined by their logos or their colour palettes or their fonts. They’re everything combined; they’re your call to action; they’re your employee behaviour; they’re your product; they’re your speech. When it comes to your brand as a whole, everyone contributes. Receptionists, travelling salesmen, designers, copywriters, admin, clients and the quality of your product and service are all equally important. Objective brand design works because we design for people. To be a good designer is to wield subjective input in an objective way. 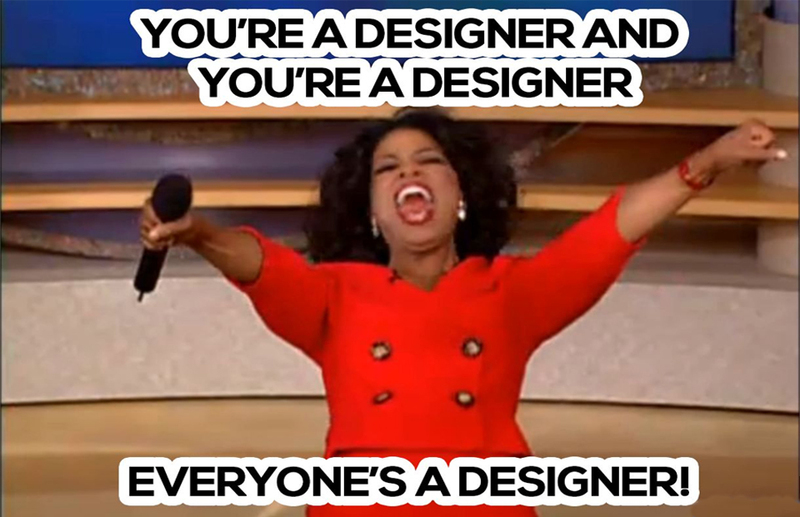 So, is everyone a designer? You decide. After all, it’s a matter of perspective. And if you can’t, ask the design experts at BEING. Don't worry. We'll keep your email to ourselves.